Trucking fleets have seen some turbulent times in recent years as they strive to keep a high employment rate of qualified drivers while also taking in and implementing a myriad of new rules and regulations. For some fleets, this has been too much and they have had to shut their doors, but for two fleets based in Phoenix, Arizona, this is only the beginning as it was announced April 10, 2017 that Knight Transportation and Swift Transportation will merge into what will be the two companies claim will be the largest full truckload company in the nation – the new Knight-Swift Transportation Holdings, Inc. The two companies will begin the merger, which will be an all stock deal for both fleets, with $5 billion in yearly revenue. Prospectively, according to officials during the announcement, the company will have a total of an astounding 28,000 employees “...operating under distinct brands”. This will also include a fleet of 23,000 trucks and 77,000 trailers. While this is, without a doubt, incredible news for the two companies, some stockholders already are finding a cause for concern as it was stated that where those who hold stock in Knight Transportation will receive a 1-1 share of Knight-Swift, stockholders in Swift Transportation will receive shares of 0.72 for each share the owned before the merge. 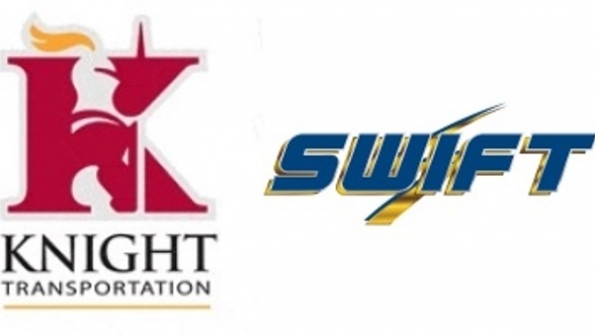 This may be due to the fact that, as of April 11, Knight Transportation (KNX) had a stock price of 33.50 on the New York Stock Exchange while Swift Transportation (SWFT) has a price of 23.83. It is also interesting to notice that after sharp increases in stock price on April 10, both have currently seen a drop in price over the last 24 hours. Knight by 1.25, or 3.60 percent, and Swift by 0.94, a 3.79 percent decrease. On the other side of the April 11 stock prices of each company is the fact the day before, April 10, when the merge was announced, Knight closed the day 13 percent higher than they had April 9 at $34.75, with an impressive jump of $4.10. 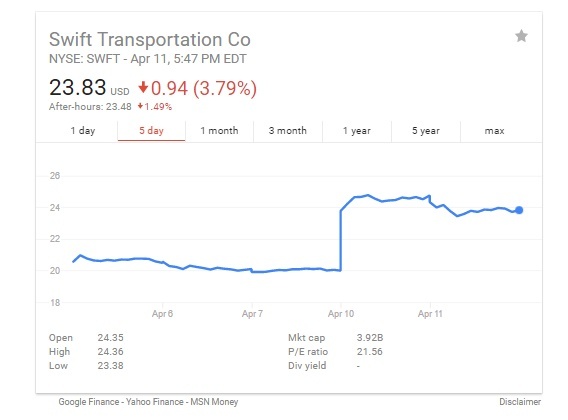 While Swift saw a higher raise in both dollars and percentage, their stock closed April 9 at $24.60, which was a $4.58 increase, or 23 percent. Currently, the implementation of the merger is still very much in the works as the companies have formed a special team to decide exactly which aspects of each fleet should be combined while they also will figure out which ones should remain independently operated by each respective fleet, hoping to reach a conclusion to their findings within the next four months. Jackson does state that the companies have already found a plethora of benefits that will come with the merger. One of the most important benefits of the merger that he sees is the fact that it will not only be a huge increase of efficiency for the new Knight-Swift, but the separate brands will also see a more efficient day to day operation of their businesses. According to Jackson, this will occur as the two companies, along with the joint fleet, share market intelligence and also “...leverage some technology”. Another benefit to the merger is that it will see an economic boost as they will be able to save more money due to bulk buys on necessities such as tires and gas. Undoubtedly, this merger will also benefit the individual driver, providing an abundance of trucker job openings. Another huge benefit they hope to achieve is prospectively saving $15 million during the second half of this year by borrowing less money while also covering more ground. The announcement continued that these savings will only increase over time, saving $100 million throughout 2018 and increasing that to $150 million the following year. While the merger has no doubt come as a surprise to many people, both Swift and Knight have long been huge names not only within Arizona, but throughout the nation's truck driving industry. Swift Transportation celebrated its 50th year in transportation solutions last year, as they started their long history in 1966. While they now transport a rather large swath of freight, they got their humble start by moving imported steel that would arrive in Los Angeles back to Arizona while also moving cotton from Arizona back to the Los Angeles and southern California area. While the company, first called Common Market, saw problems gaining traction during the early days, but by 1984, less than 20 years since Jerry Moyes began his venture, he and his family and partner began to see a $25 million annual revenue. This increase in revenue continued as less than ten years later, in 1990, Swift Transportation operated 800 trucks and had advanced to being a $125 million carrier. Moyes' substantial increase in revenue is also attributed to the fact that he was more than a typical fleet owner and was an astute businessman who has bought out 13 other motor carriers since 1988. Overall, Swift now has close to 20,000 trucks and more than $4 billion in revenue. Knight Transportation, on the other hand, has a much shorter history within the trucking industry, but still has made quite the name for their company, partly helped by the numerous amount of trucking job openings it has offered over the years. Interestingly enough, though, the two transportation companies have a long and lasting history with each other. In 1990, four Knight cousins consisting of two sets brothers Randy and Gary and then Kevin and Keith came together to found Knight. All four of the Knights had worked previously for the Swift company. At one point, one of the Knight cousins, Randy, was partial owner of Swift. That was before Moyes bought out his portion of the ownership. Possibly even more interesting is the fact that both the Moyes and Knight family were both originally from the very small town of Plain City, Utah before moving to Phoenix during the mid to late 1960s. When they were founded in 1990, Knight was a very small company which ran different items between Phoenix and Los Angeles. Less than 30 years later, Knight now employees 4,400 people with a fleet of 4,000 tractors and 8,700 trailers. To give an idea of how quickly Knight was able to grow their company, in 1991, only one year after the company was founded, they saw revenues of around $13 million while twenty years later in 2011, revenues grew to $866 million. While Swift has consistently generated more profits than Knight, it may come as a surprise to some that Knight is capable of generating their still substantial profit with more efficiency. Last year, for example, Swift had more than a quarter more of the profit of Swift with $150 million, while Knight was able to generate $94 million in profit with only one third of the number of trucks and nearby service centers in Texas. While Moyes retired last year after 50 years of service and building the Swift name, he remains excited about the merger, as he is still the largest stockholder within the company. While both boards of the two companies have voted to go through with the merger, the stockholders have yet to vote. Though much of the vote is unknown, Moyes, with his 56 percent of Swift stock, and both Kevin and Gary Knight, with their 10 percent of stock in Knight vow to vote for the approval of the merger. Moyes will also serve as adviser to Knights, including Kevin, who will be both executive chairman Knight-Swift and president of Swift operating entities. One logistics expert has said that this merger does more than represent two huge truck driving companies coming together, but is instead the “...pupil acquiring the teacher's company...” They furthered the statement saying that this will also allow these two companies to combine forces in order to compete with even larger companies inside of the truck driving job industry. Mergers are not anything new to the industry. Late in February, Central Freight Lines expressed their interest in buying parts of Wilson Trucking, a nearly 100 year old “less-than-truckload carrier” with close to 30 terminals along the Southeast, including Florida. During the same month, Daseke Inc. was able to go public by merging with Hennessy Capital Acquisition Corp. II. Even Navistar International Corp. reached what they deemed was a strategic alliance with Volkswagen Truck & Bus. Whether or not this is a case of a long well known name in the industry trying to compensate for lower stock prices or two Arizona giants coming together to go forth on a new venture in order to become larger and learn and adapt from each other's practices, there is no doubt that it will be an interesting time for Knight Transportation, Swift Transportation, and most certainly for the new Knight-Swift Transportation.